The timing dictionary. This is the file generated by the Compile window that allows fsTimer to look up registration information by bib ID. It will be named project_name_timing_dict.json, unless you specifically renamed it. A "pass" ID. As explained previously, when the pass ID is given to a time, it leaves that time out of the results, essentially blanking it out. It also acts as a placeholder for times that will be later corrected, as described in Section 3. The key for marking times. We generally use spacebar, but you can also use period or forward slash. It is important that whatever key you use it is not contained in any of the bib IDs! For instance, if the bib IDs are "A 01", "B 02", etc., with a space actually in the ID, then you should not use spacebar to mark times. Once these have been specified, the timing window loads. The first thing you will do in a race will be to press "Start!" at the exact moment that the race begins. This starts the clock ticking and all marked times will be recorded as time elapsed since this moment. At the bottom of the window in the screenshot above it says "20 registrants. Checked in: 0". 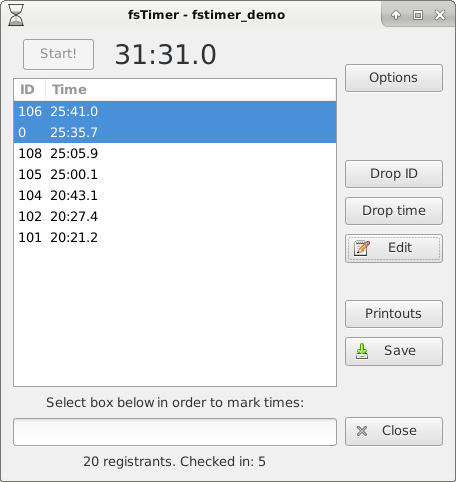 The 20 registrants are the number of bib IDs in the timing dictionary. 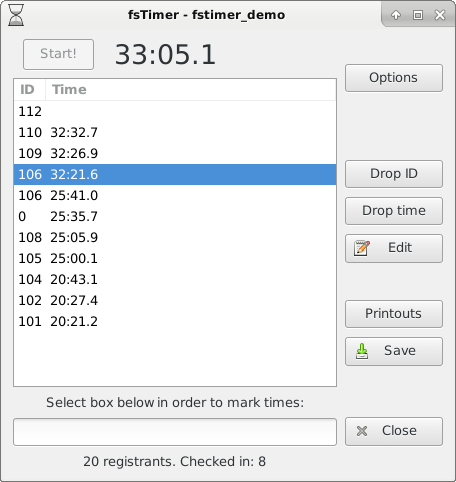 This will generally be the number of people registered for the race, but can differ from the actual number if, for instance, there were overloaded IDs that were de-assigned during compilation. It can also differ from the actual number of racers on the course if there are racers who register and pick up a bib (and thus are in the timing dictionary), but don't end up running the race. As you check in racers (by entering their bib numbers into the timing window), if the bib number is one of those in the timing dictionary, then the "Checked in" number will increment. 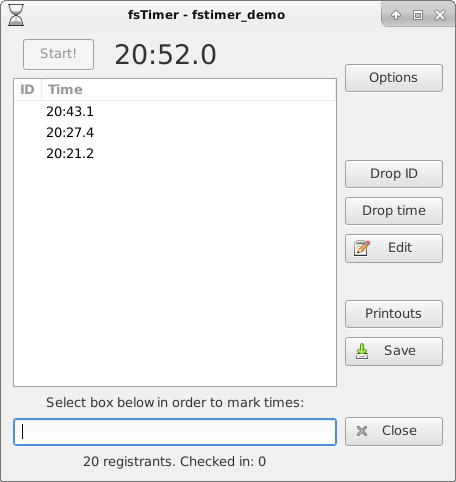 All of the tasks related to the timing process take place in the entrybox at the bottom of the window. Make sure that you have clicked in that entrybox, otherwise any input (like pressing spacebar to mark a time, or entering a bib ID) will not be recognized. Pressing spacebar (or whichever key you chose for marking times when opening the Timing window) will record the current time (relative to the Start! time) as a blank time in the window. The time is listed as [hr:]min:sec, and the "ID" column will be blank. As multiple times are marked, they will be recorded in their proper order. As a note, if you just hit Enter without anything entered into the entrybox, then it will do a usual ID entry where the ID is a blank string ''. Blank IDs are not included in the results printouts (they behave in the same way as the pass ID). As the red warning states, you should exercise extreme caution when making these edits, as they cannot be undone if you forget the original values. 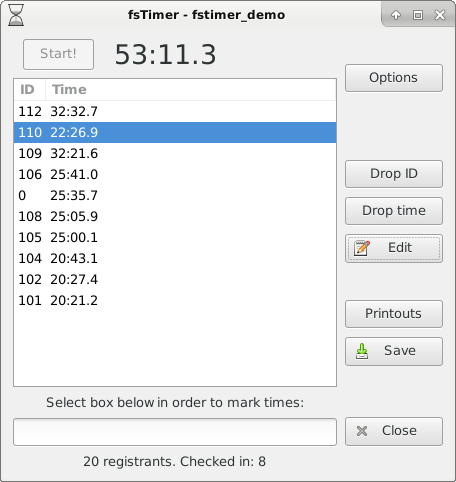 "Drop time" performs the same function, but on the stack of times. Exercise extreme caution when dropping IDs or times, as this cannot be automatically undone. The "Save" button on the right saves the results (starting time, marked times, and bib IDs) to a file whose name will include the date and time that the Timing window was opened (this way, results will never be accidentally overwritten if you open the Timing window at another time). If the Timing window was opened on Jun 1, 2013 at 2:10pm and 30 seconds, then the results are saved to a file project_name_Sat_Jun_1_141030_2013_times.json. 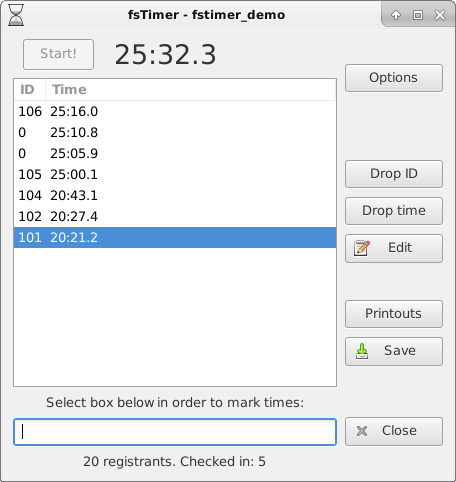 The timing session is saved in such a way that it can be loaded from the timing window without any loss. 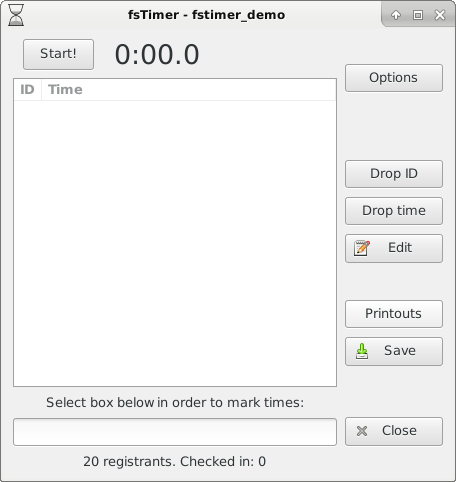 It is a good idea to save periodically during timing in case something catastrophic happens (like the computer dies), however keep in mind that any time the entrybox in the timing window is not selected (for instance, because you have used the mouse to press the "Save" button), no times may be marked and no IDs may be entered, until the mouse has moved back to select the entrybox. The "Printouts" button automatically generates nicely formatted results printouts, saved to html in the project directory. These html files can then be opened in any web browser and printed from there. 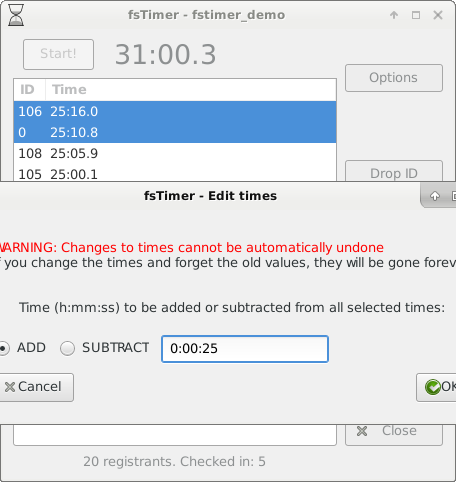 The actual filenames will again incorporate the date and time at which the Timing window was opened, so as to not be automatically overwritten by a later session in which the Timing window is opened. With the same date and time as above, the filenames would be project_name_Sat_Jun_1_141030_2013_alltimes.html for the overall results and project_name_Sat_Jun_1_141030_2013_divtimes.html for the divisional results. The results will automatically be sorted into places, and all of the fields that were chosen when creating the project will be filled in from the timing dictionary. If some information is blank in the database, this is not a problem; it will simply be left blank in the results. In particular, if a bib ID is not assigned to any racer (perhaps because it was overloaded) then the Place, Time, and ID will be filled in, but the remaining registration fields will just be blank. Notice also that the "pass" IDs (0) do not show up in the results. Any times with pass IDs will be ignored when creating the results. These divisions are defined by gender, so any IDs that do not have gender in the timing dictionary will be left out of the divisional results. 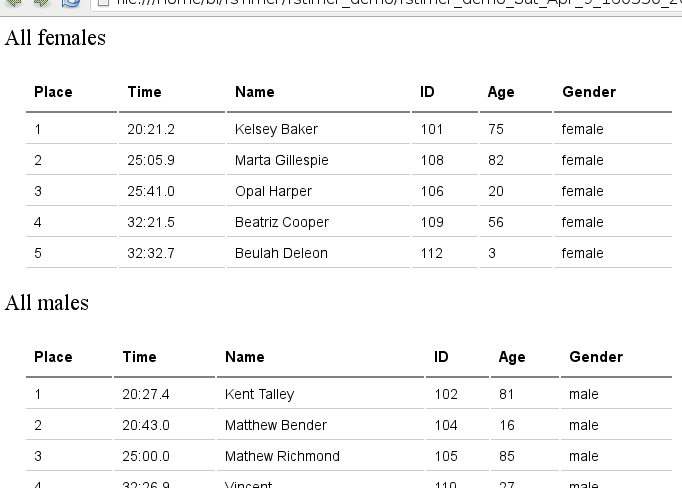 Thus bib IDs that are not assigned to any racers in the timing dictionary will show up in the overall results as the bib ID, but will not show up in the divisional results at all. In addition to writing out nicely formatted html files, you can write the results out to a csv spreadsheet by clicking on the "Options" button and then selecting "Save results to CSV." This will produce two csv spreadsheets, one for all times and the other for divisional results, with all of the same data that is found in the html files. 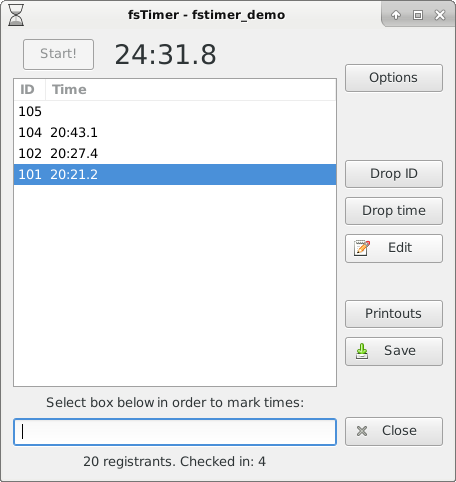 Timing sessions that have been saved using the "Save" button can be loaded by clicking on the "Options" button and selecting "Load saved timing session." A warning: This will replace any IDs or times that are currently in the timing window, and so if these data have not been saved they will be lost forever. 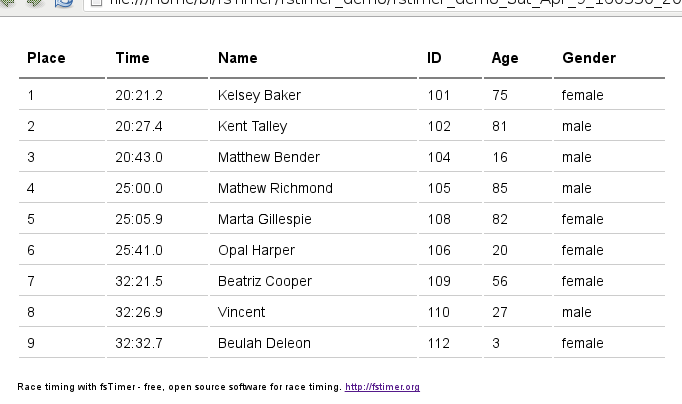 Keep in mind that this will load the marked times, the bib IDs assigned to them, and the Start time. 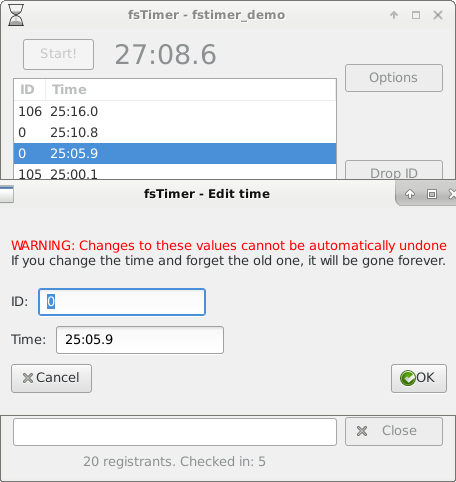 It will not reload the timing dictionary, this will still be whatever was selected when opening the Timing window. On one of the computers (here we will use the stack of times, but it works just as well with the stack of IDs), press "Save". This will generate a file with a name like project_name_Sat_Jun_1_141030_2013_times.json, with the project name and the date/time at which the timing window was opened. Copy this file over to the other computer (the one containing the stack of IDs), for instance using a USB stick. On the computer with the stack of IDs, press "Save" just in case. Press "Options" and then select "Merge in saved IDs or times." The stack of times will now be added to the already present stack of IDs. The merge will only succeed if your current data in the timing window are only times or only IDs, and the file that you select to merge in is (respectively) only IDs or only times. The long number in the entry box is the number of seconds since the start of the Unix epoch - but this isn't important. If you add or subtract seconds from that number, they will be correspondingly added or subtracted from the start time. For example, subtracting 300 from the number in the above screenshot yields 1460241732.76. If we were to replace the number currently there with 1460241732.76 then the start time will be pushed five minutes earlier. This will add five minutes to the current running clock time. Importantly, if you change this time mid-race, it will not adjust any times that have already been recorded. Those times could be adjusted using the block edit functionality described above. Pressing "Restart clock" in the "Options" menu will restart the clock to 0. As before, it will not change any already recorded times. 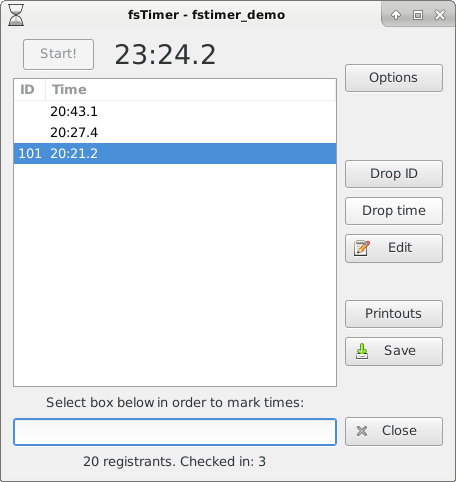 You can also edit the registration data from the timing window, for example in order to correct overloaded IDs after the timing has finished, or to fix other registration errors that you notice in the printouts. Choose "Edit registration data" from the "Options" menu, and this will open the registration database so that it can be edited. Changes will not be autosaved, so be sure to press "Save" before closing. The timing dictionary will be immediately updated upon closing, and so it will require that all of the IDs are unique. Once the edits are made and this window is closed, you will be back in the Timing window, but with the corrected registration data loaded. Pressing "printouts" will print results with the corrections. This completes all of the details about using fsTimer for a standard, single-lap race - You are now ready to time the race! The next two sections describe additional details to know if you are timing a multi-lap race, or a handicap race. Continue on to Timing multiple laps.